Long-time road warriors have probably noticed some serious upgrades to their once humble accommodation. Business travel is booming. Over the past several years the amount of travellers (and the money companies are spending on them) has reached record highs, and it looks like it’s only going to keep increasing. Because of this growth, many long-time road warriors have probably noticed some serious upgrades to their once humble accommodations. From executive lounges in airports and fully reclining sleeping seats in your flight’s business section, to hotels that have been transformed to meet every need a business traveller could possibly have, travel has definitely swung into the business traveller’s favor. And nowhere is this more apparent than in the hotel industry, where chains worldwide are doing everything they can to ensure loyalty in this newly competitive market. Here are the hotels that are doing it best. We love Best Western Plus, and we know what you may be thinking, but don’t knock it till you try it. They’ve dramatically upgraded their appearance and facilities in recent years and they've become the #1 brand in offering competitive corporate rates. Add in extremely supportive staff and you’ve found one of the best values in the hotel world. We also highly recommend Marriott. In case you didn’t know, the Marriott brand is enormous, global, and universally praised. 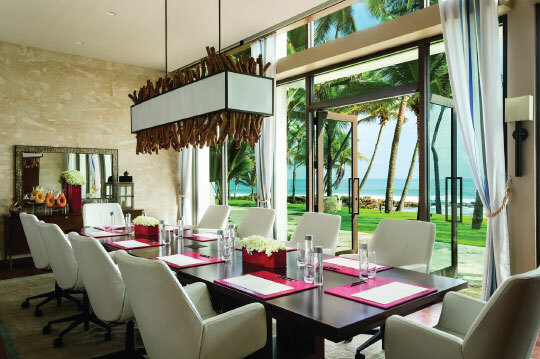 Their rewards program is often viewed as one of the best in the business and applies to a wide variety of accommodations, from many of their upscale Ritz Carlton and J.W. Marriott hotels to their Courtyard brand and Springhill Suites, which is the #2 brand in offering competitive corporate rates. Both Hampton Inn and Holiday Inn are also surefire bets. These popular chains are known for consistency, good value, and they also happen to be tied for #3 in offering competitive corporate rates. Plus, with the knowledgeable staff and free breakfast from Hampton Inn, you can rest easy knowing that you’ll be taken care of on your business trip without breaking the bank. 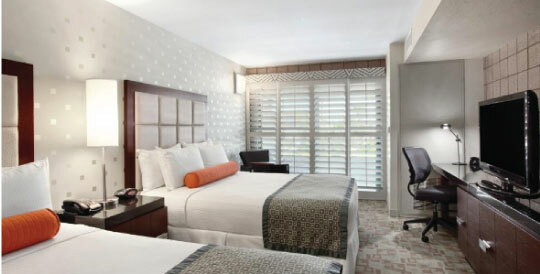 For a balance between budget conscious and luxury, we suggest Hyatt, which boasts competitive rates, helpful staff, and free Wi-Fi to keep you connected and attentive to the task at hand. 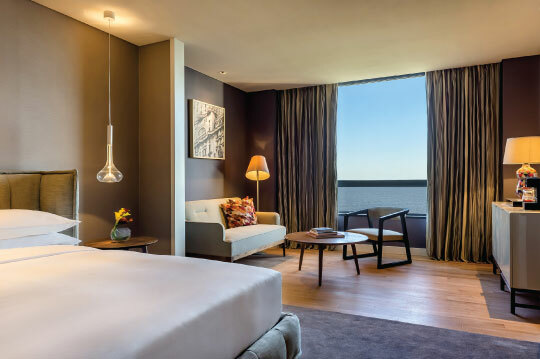 However, if your company has the funds to spare, there are plenty of upscale, yet business traveller-driven hotels that are dominating the market both domestically and internationally. 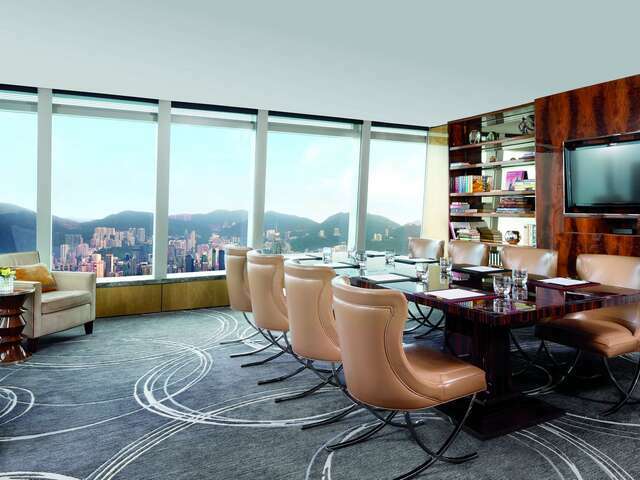 Hotel chains like the Four Seasons, Ritz Carlton, and InterContinental consistently land on best-of lists with business friendly locations all over the world, though the Peninsula Hotel is perhaps the reigning king. This elegant hotel chain is beloved for implementing some seriously upgraded business accommodations with a laser focus on technology, all in a luxury setting that you’ll look forward to kicking back in. Now is a great time to be a business traveller, and no matter the budget you’re starting with there is a hotel that will be just the right fit for your business travelling needs. For more information on choosing and booking the accommodations that are the best value for you and your company contact one of our business travel experts.